Preventive and positive health advocates prefer to stop disease before it becomes a problem. In this article we will show you how to beat adrenal fatigue without the use of medicine for your proactive adrenal health. From a holistic wellness view, stress – which we can experience both mentally and physically – important hormones, and the adrenal glands are all connected. The concept of adrenal fatigue is controversial in medical research. The term is a relatively new one; it encompasses a group of symptoms and bodily dysfunctions. The brain and the adrenal glands are linked together, so a medical problem with the adrenal glands can be rooted in either place. This dual location of adrenal function brings up another controversy: the debate over which comes first, stress or adrenal fatigue. Does stress in the mind cause the adrenal gland to be unhealthy or does an unhealthy adrenal gland cause us to feel the emotion of stress? Adrenal fatigue is a term for the symptoms that occur when your adrenal gland function is less than optimal. What happens in the body when the adrenal gland is not functioning properly? A lot of major bodily functions are impacted. Adrenal glands are responsible for around 50 different hormone chemicals that the body needs. You can imagine that disrupting just one of these functions, like how you process blood sugar, for example, can have a wide range of negative health affects for the whole body. This short list of adrenal gland functions, and the vast health problems that can result, illustrates how challenging it would be to list all of the symptoms that can indicate a problem with adrenal fatigue. When necessary, the brain sends a signal to the adrenal gland to start functioning more. This usually happens when you wake up in the morning to jump start your day. Functional Medicine Practitioner Dr. William Cole says, “The adrenal glands, which sit on top of your kidneys like little kidney baseball caps, release several important hormones, one of which is cortisol.” Cortisol is your “revving up” hormone for when you have to get things done, or when you face a stressful event. Dr. Cole adds that it is more of an issue with the brain than with the adrenal glands when a person suffers from adrenal fatigue, stating, “Typically, adrenal fatigue is when the brain-adrenal (HPA) axis isn’t working so well.” This particular dysfunction of the HPA axis can result in an incorrect level of cortisol being released. For instance, the gland may release low amounts of cortisol when when it should be producing higher levels of this hormone. When adrenal glands continue to produce cortisol under stressful conditions, the glands can grow depleted and therefore stop producing the cortisol that the brain is signaling the body to make. Basically these glands have become overworked and fatigued, and are asking for a day (or several days) off. Tiredness is another word for fatigue. If you are experiencing adrenal fatigue, you feel like there is not enough coffee in the world to give you the energy you need. 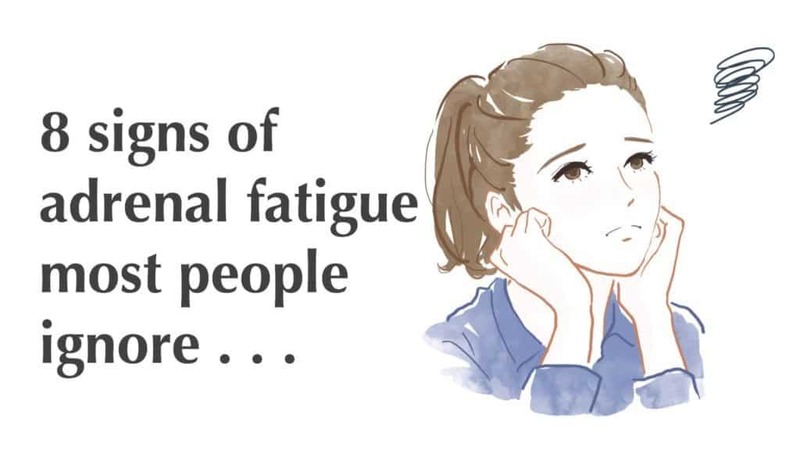 We have already mentioned that symptoms of adrenal fatigue are wide due to the many bodily functions that are affected from a low functioning adrenal gland. Heightened stress and activity for too long can cause adrenal fatigue. The adrenal glands become tired of continuously producing excess cortisol and they begin to shut down production in protest. Poor adrenal gland development as children is a possible cause of adult adrenal fatigue. Researchers have found that a natural tendency toward adrenal fatigue and low cortisol levels may be inherited at birth when babies are born to parents of traumatic stress. Degeneration of the adrenal glands as we age. Decreasing function of adrenals due to immune system dysfunction is called Addison’s disease or primary adrenal insufficiency (PAI). A tumor or disease of the adrenal glands can also result in degeneration. Of these three, we obviously have the most control over stress reduction. We can also help our body by giving it nutrition and antioxidants to help it age as gracefully as possible and prevent disease. Positive people prefer to approach their health care and wellness without prescription medicine. The most common prescription for adrenal fatigue is cortisone and other corticosteroids that reduce various kinds of inflammation. The dosage of medicine prescribed may change depending on stress levels, illness, the need for surgery, or a medical emergency. Medical professionals monitor your blood levels for hormones like cortisol to determine whether prescription medications are having the desired, positive result. Other medications may be prescribed based on the symptoms. 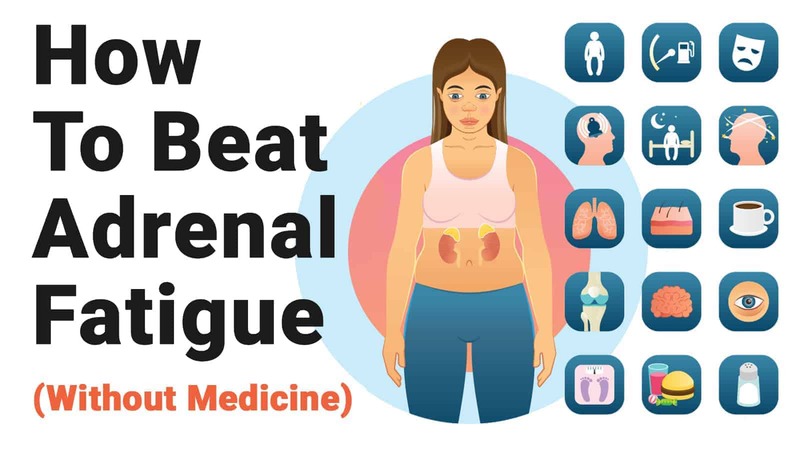 Blood pressure medications and blood sugar control drugs are often prescribed, since these bodily functions are impacted by adrenal fatigue. The holistic wellness options to beat adrenal fatigue without medicine include lifestyle changes, nutritional changes, and alternative wellness. Reduce stressors and time spent in stressful situations. Decrease the amount of work you do in a day. Listen to and speak positive affirmations. Exercise, specifically choosing calming yoga poses. Build more down time into your schedule. Eat whole vegan foods and eliminate added sugars. Changes to your life that remove triggers of stress and add relaxation are the goal. If walks outside cause you stress, then find a substitute activity that gets you in motion but fits your personality. Does poor diet cause adrenal fatigue? No, but causing your body to be in a state of stress because it lacks proper nutrients won’t help beat adrenal fatigue either. Healthy vegan protein sources and vegetarian fare will provide your adrenal glands with necessary nourishment. Dr. Wilson also says that salt and salty foods are dietary additions you may want to add to increase adrenal function. Remember that reducing stress helps your adrenal gland function. Therefore, you can reduce stress caused by inadequate nutrition by choosing good vegan sources of protein and a wide variety of sources of vegetarian nutrients. A healthy, balanced, and well-rounded diet will help your body get what it needs rather than starving it of vitamins and minerals. Seek advice from a nutrition professional if you need further guidance in achieving your health goals related to adrenal wellness. Avoiding certain foods may also be a positive action step to beat adrenal fatigue without medicine. Licorice root has also been noted as a potential adrenal enhancer, but noted elsewhere in research as a food to avoid so we advise caution with licorice root. Grapefruit is also mentioned in research articles as a food to avoid for recovery from overstressed adrenal glands. Acupuncture, massage, reiki, cranial sacral therapy, and other healing modalities that focus on a return to the natural energy flow and state of wellness for the body are also helpful alternative methods without the use of medicine to relieve stress. If you feel stress, it is likely that your adrenal glands could use some positive attention. In summary, you can provide your body and mind with superior vegan nutrition. Additionally, avoid sources of environmental and bodily stress and seek out what soothes your soul to beat adrenal fatigue. Your adrenal glands will function better if you choose to pursue healing methods that support your wellbeing, because these will also support your optimal adrenal health.